Join us for this special broadcast of a panel we recorded at the Enoch Pratt Library last week. Join us for this special broadcast of a panel we recorded at the Enoch Pratt Library last week. The panel was a tribute to Manning Marable, the brilliant scholar who passed away just days before his groundbreaking new biography of Malcolm X was published last month. 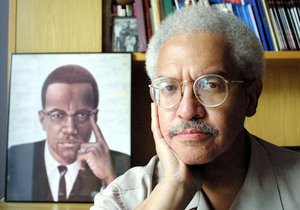 Manning was scheduled to speak about Malcolm X: A Life of Reinvention, which seeks to redefine Malcolm’s legacy in many ways, at the Enoch Pratt Library in Baltimore, and so to honor his life and work we put together a panel of other leading thinkers to discuss the new insights on Malcolm X’s life that he broght to light.